Aunt Sally Good Food: Fudging on Fudge? Here is a question. This holiday season, I have tried some new fudge recipes. I follow the instructions but when I try to cut the fudge it is not solid enough to cut even when it sits over night in the refrigerator or put it in the freezer. What I am I doing wrong Aunt Sally? The culprit could be the recipes or you might not be following them as closely as you think. A definition first. Real fudge is not the candy made with marshmallow creme and chocolate. That might be tasty, but it is not fudge. Real fudge is a form of fondant or crystalline candy. It is the formation of fine crystals that gives fudge its creamy texture. This is where science comes in. Crystalline candy depends on perfect timing and exact ingredients. Substituting, say, brown sugar for white sugar will add too much moisture, since brown sugar contains more water. Corn syrup acts as a crystal inhibitor, slowing down the crystallization process. Leaving it out will upset the crystallization process. Adding too much alcohol can disturb the process, too. Beating the fudge before it cools, or beating with an electric mixer, will make large crystals resulting in grainy fudge that never sets. Use a wooden spoon and lots of elbow grease instead. Check temperatures with a thermometer. For more detailed information, check out San Francisco's Exploratorium. 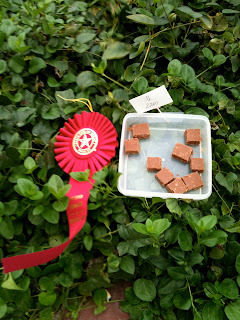 Meanwhile, try the recipe for the prize winning fudge you see above. That picture was taken moments after winning a ribbon at The State Fair of Texas. The recipe is from the Joy of Cooking. Bring to a boil and cook 2 to 3 minutes until the steam washes down from the sides of the pan any crystals which may have formed. Uncover, reduce heat and cook without stirring to the soft-ball stage, 234º. Remove from heat without jostling or stirring. Cool the candy to 110º. You may hasten this process by placing the hot pan in a larger pan of cold water until the bottom of the pan has cooled. Then beat until it begins to lose its sheen. Pour the fudge into a buttered pan. Cut into squares before it hardens. I bet it is great, but will you please give an easy recipe? I never do well with recipes that I need the thermometer to make! Your site is amazing and I love being able to dream about all of your mouth-watering dishes!